You all should know by now my favorite store in all the world- the place that inspires 97% of my design ideas- the most lovely 20 minutes I can spend shopping any day is ducking into Anthropologie. 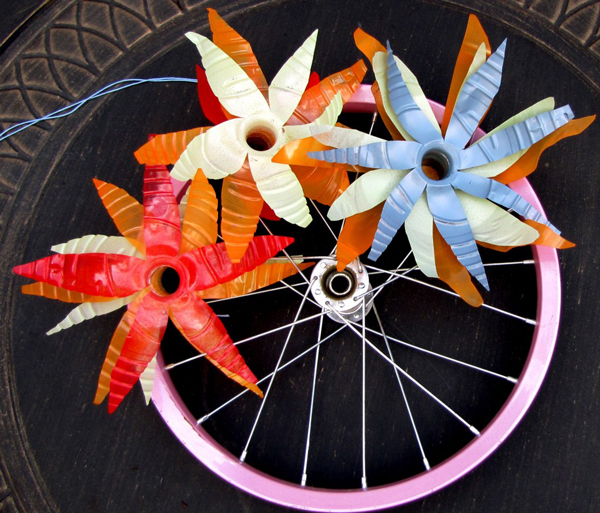 A few weeks ago I spotted their spring window display of upcyled bike wheel wreaths and just like the snow flake inspiration from this winter, I knew I just had to make them. A pretty summer wreath was the result of this water bottle flowers craft. I found an old bike for $4 at a thrift store. We took off the bearings, tires and bolts leaving me with 2 lovely wheels for wreaths. Any old wheel you can find will do, mine had the added benefit of being pink. I snuck out with the husband this weekend and showed him my inspiration window, explaining that mine wouldn’t be quite as cute because I didn’t have the beautiful glass flowers. To which he responded, “those aren’t glass they are plastic”. Plastic water bottles to be exact. Plastic water bottles simply cut up and spray painted. My version involved- 1 four dollar bike, 12 recycled water bottles and plenty of left over spray paint. Creating this loveliness. My favorite wreath ever, ever, ever. First collect a wide variety of different size plastic bottles and cut the tops off. Then begin cutting away on the diagonal of each top. Bend back the edges fanning them out to create a flower. Attack the flower with an easy coat of colorful spray paint- no perfection required. Layer the bottles together, using different colors and sizes to add texture, glue each flower together by its separate base. Attach to the wreath wheel with string or floral wire. Hang it up and smile. It is quite a joy. AHHHHHmazing! oh my gosh Vick, that is awesome! this is fantastic! i love your site! Yes, I agree. That is amazing. Probably the best DIY I have seen in a very long time. Love it! think i can hang up flowers like that all over my house?! very fun!!! Thanks girls, I love your encouragement:) They were super easy to make so please send me pictures if you decide to try it, or if you hang up flowers around your house, I think that is such a fun idea indeed! Found you through One Pretty Thing. This is such a cool recycling project. The wreath has turned out beautifully. Must recreate this. I like it better than my own bottle-recycled flowers (see my blog if you are interested). I was in LA and saw the same window display minus the bikes, and absolutely fell in love w/ the idea! i’m going to try and make a room divider using the flowers suspended on fishing line. Thanks for the instructions! I had no idea they just used spray paint. I saw these at Antrho, mine has since changed windows but seeing your post reminded me how beautiful they were…. That is so cool. Thanks for sharing. Thank you so much for posting this. My friend and I saw that same display in the Thousand Oaks Anthropolgie and have been wanting to recreate ourselves! I am in midst of a baby boom amongst my friends (7 expecting!) and am getting some great ideas for the showers I’m hosting from your site! Love the wreath and the thought of finding a use for plastic bottles. I am going to try this. Thanks! So cute! What a good DIY project :). And a great way to recycle plastic bottles! What an adorable wreath ~ I love it! I am begining a new linky party on Wednesday ~ “Fall” In Love. Please join in on the fun. Have a happy and blessed Labor Day! i hope you don’t mind? i linked a photo of this wreath to my blog today. i was just goofing around with my wreath. but yours is really neat!!! now off to ck out more of your place…. 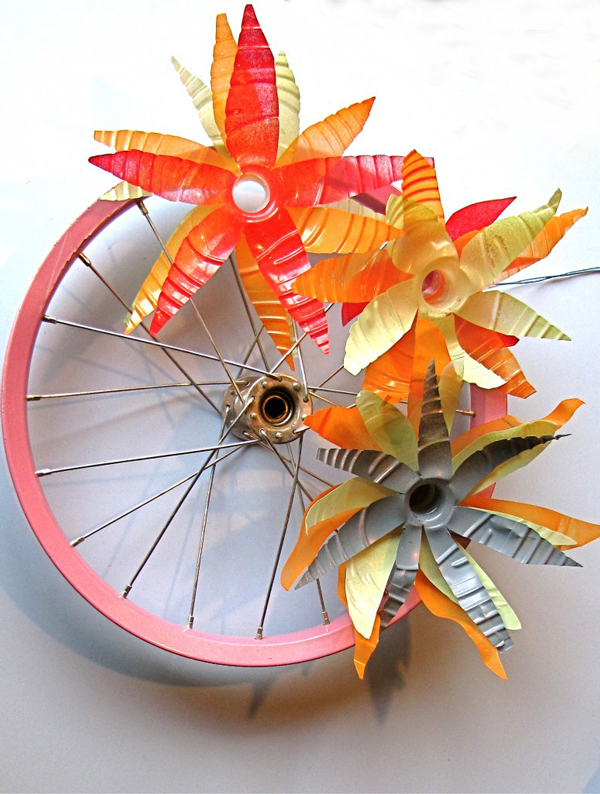 just made a bike tire wreath & ADORE your version using the wheel! Some people will actually put a whole bike on a wall as decoration.